WOW, has it really been that long since I posted anything? Time sure does fly! In short, I have been up to my elbows in frosting and cake batter (and loving every minute of it!) I promise to be back in the next day or two with some actual recipes but for now I will entertain (and distract) you with some cakes that will hopefully make you smile! These were for Will's co-worker. She is pregnant with twins!!! How wonderful!!! 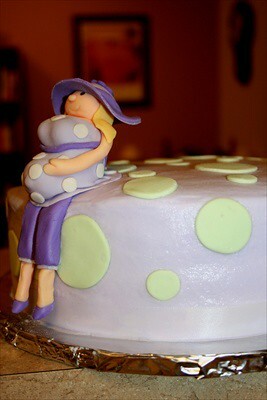 Today is her last day before maternity leave and they are having a potluck luncheon for her. I was requested to make two round cakes both with butter cream (UGH - I just can't get used to seeing butter cream after working with fondant! I'm totally obsessed with getting it as smooth as possible to try to resemble fondant). They are both 9 inch rounds - one is white cake the other is strawberry. 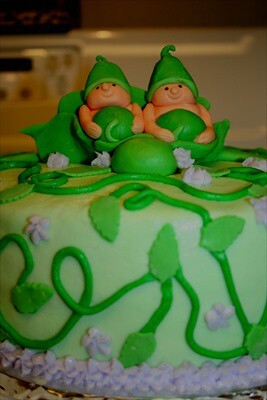 The figures on top are made totally of fondant. This was the first time I actually tried my hand at making figures. How'd I do? The colors were lavender and mint green to match the nursery colors. 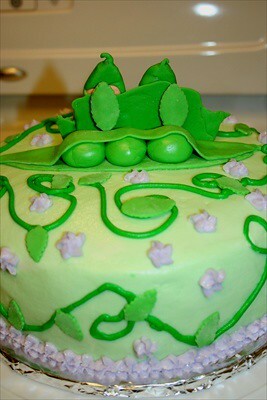 Next we have the two peas in a pod, pea pod cake. I got my inspiration from this site. I think these are Will's favorites! Here they are again looking down from the top. I also tried to incorporate the nursery colors in this one by including the little lavender flowers. If you love that, wait until you see the back! Here it is - a huge pea pod!!! I needed support for the little guys as I knew Will would be driving on the freeway, alone, in a manual transmission car, so I knew it needed TONS of support - hence the giant pea pod. In addition to these I had an order for a dozen blueberry muffins that I fresh baked at 1 am! Today is my "day off" and boy do I need it!!! I have another cake that is due on Saturday - a Steelers cake - imagine the irony of it all - a Pennsylvania girl living in California making a Steelers cake for a California man! Too funny! Poor Will, tomorrow is our 5th year anniversary and he'll be lucky to get cake scraps for our anniversary dessert. Oh the life of a baker!!! Hope you enjoyed them! Thanks for looking! Looks GREAT!!! Love the twin peas! Too cute! Btw, I have identical twin boys! They just turned 13 last Saturday. Goes by fast! 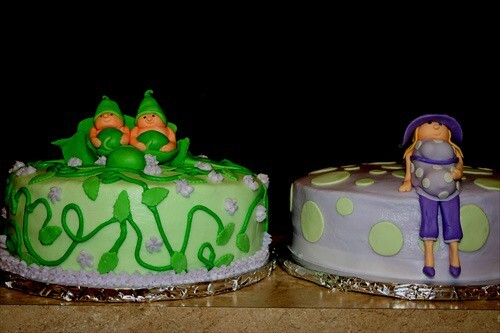 Oh Stacy these cakes are soo cute! You are soooo talented! whooooaaa look at them boobies!! absolutely beautiful!! i love the pea pod! Awesome. 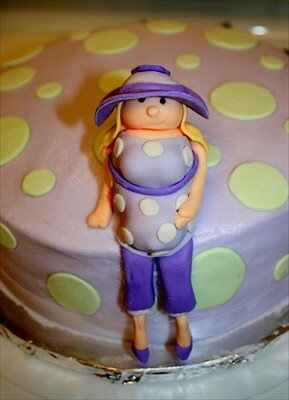 I absolutely love the pregnant lady's protruding belly button! And the two peas are adorable! GREAT job! This is one talent I know I just will never have. Frost on! 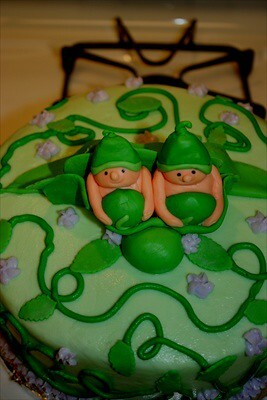 I love the two peas in a pod cake! So adorable, if it was me I wouldn't want to eat it! 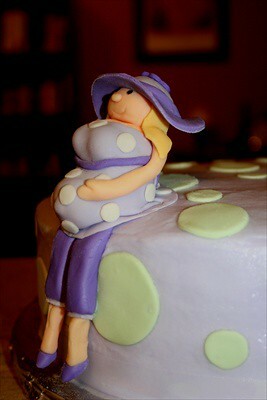 The pregnant lady looks so cool too! You have real talent for this, your creations are just wonderful. Oh, and of course, happy anniversary to you and your hubby! OMG! Those pea pod babies are so cute!!!!!!!!! !